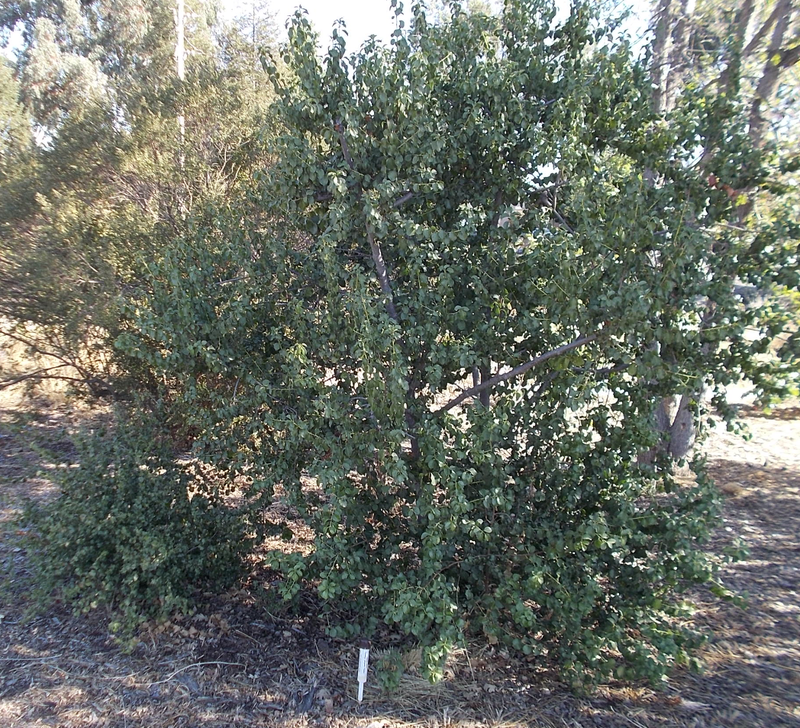 The holly-leafed cherry can be grown as a tree that will be covered with clusters of white flowers in the Spring, or can be kept trimmed as a dense hedge. By summer, the blossoms will have turned into round, marble-sized fruits that gradually blush red, then almost black when they are fully ripe. Holly-Leafed Cherries as an Indigenous Food Source The comedian George Burns said that God’s only mistake was making the avocado pit too large. But the avocado has nothing on the holly-leafed cherry. Bite into one and you will find that the sweet-tasting pulp, unlike our commercial cherries, is little more than a thin coating around a large, hard pit. Sweetness rapidly gives way to the bitterness of the pit, due to the presence of hydrocyanic acid in the pit. 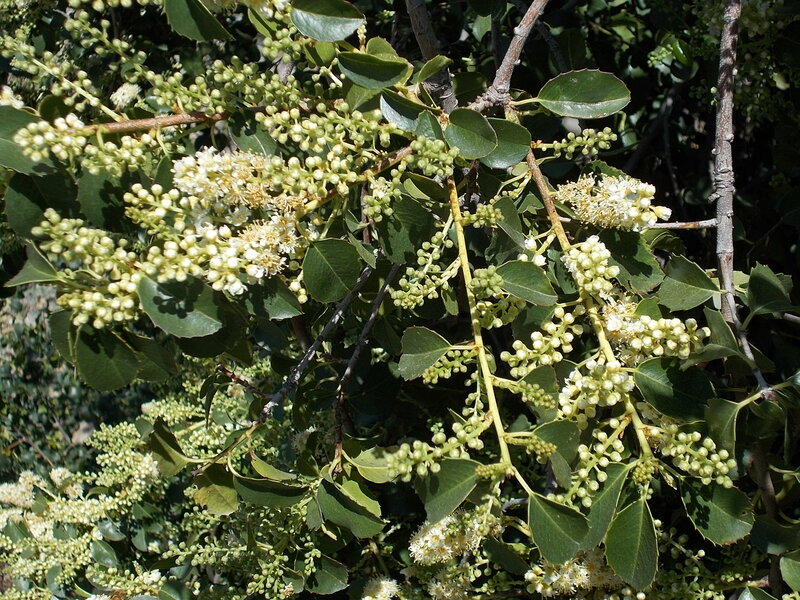 Nonetheless, the Native Americans of California found a way to use Prunus ilicifolia, commonly called “slay” or “islay”, as a popular and versatile food. They were more interested in the pit than in the pulp, and for some tribes the kernels inside the pits were second only to acorns in importance. But first, the highly toxic hydrocyanic acid had to be removed from the pit. To de-toxify the pits, they were first dried in the sun and cracked open to remove the kernels. The dried kernels could be stored indefinitely, but before using them as food they were pounded and mashed and rinsed in water for several hours, until they were no longer bitter, in order to leach out the hydrocyanic acid. The kernels could then be ground into a flour or porridge, or formed into cakes or balls and served with meat. The flour made from it tasted like beans or chestnuts. The ground meal was used as a base for soup, or made into tamale-like foods. In fact, prepared islay was considered a delicacy that was used for ceremonial offerings, or offered as a welcoming gift for visitors. 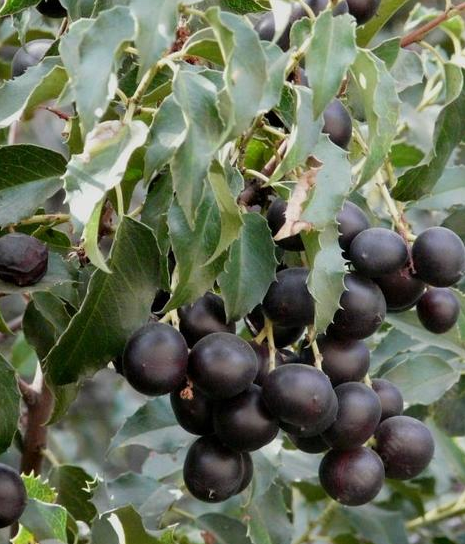 The Spanish missionaries recognized the importance of the holly-leafed cherry to the Native Americans. Judith Larner relates that Indians living at the missions were given time off to allow for them to harvest this nourishing food. The fruit was sufficiently abun- dant that enough could often be gathered to feed an entire village. Captain Don Pedro Fages, who was in charge of the Presidio of Monterey in the 1770’s, wrote of the “good tamales made from islay by the Salinan people”. The Rest of the Plant Wasn’t Wasted It might take a lot of cherries, but the thin pulp did not go to waste. Consumed fresh, they were a welcome snack or a source of moisture for thirsty hunters. They could be made into fruit leather, or soaked in water to make fruit juice. They could even be fermented! 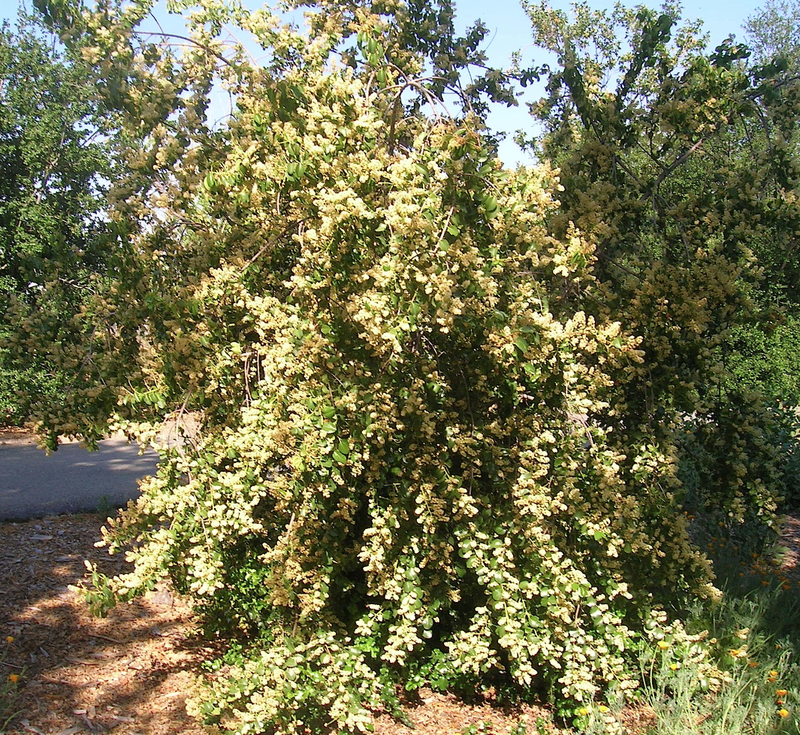 The leaves have an almond scent when crushed. The flowers are full of bees in the Spring. A tea made from the bark or roots was used in treating coughs and colds. The wood was used for making bows. 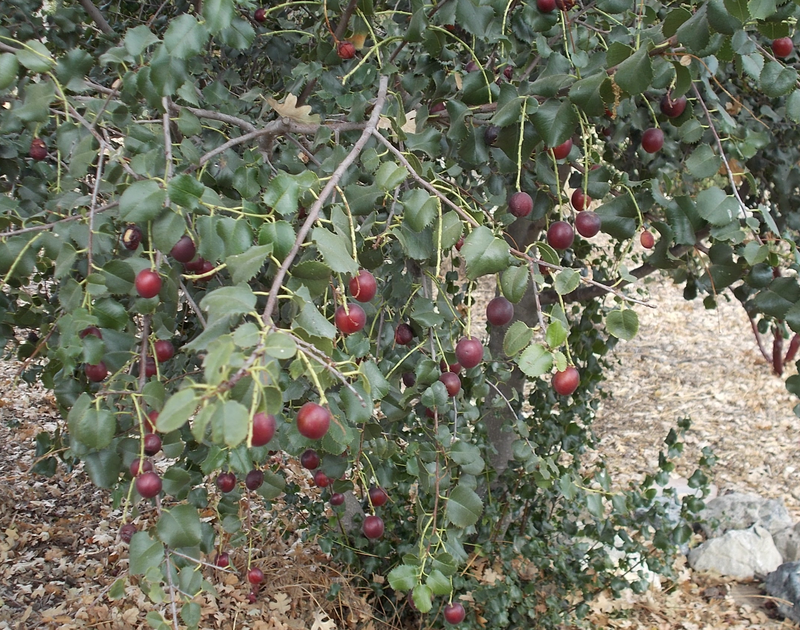 The fruits were an ample food source for scrub jays, mockingbirds, robins and small mammals. The leaves were an important browse species for bighorn sheep and mule deer, especially because they are still green during dry California summers when many other browse foods are gone. 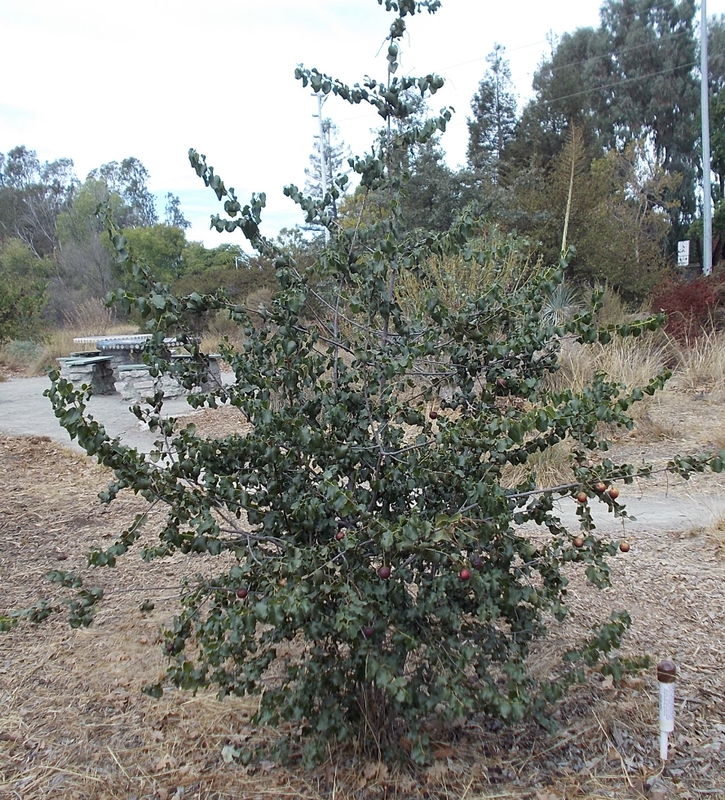 And in addition to being an attractive evergreen for any domestic landscape as well as being trimmable into an effective hedge, holly-leafed cherry is a good control for erosion on steep hillsides. Mama tree and its baby! Quote du Jour “One person’s scruffy native, begging to be pruned, is another’s harbinger of our subtle seasonal changes and a desirable emblem of the naturalistic garden.” From California Native Plants for the Garden (Bornstein, Fross, O’Brien), p. 35.